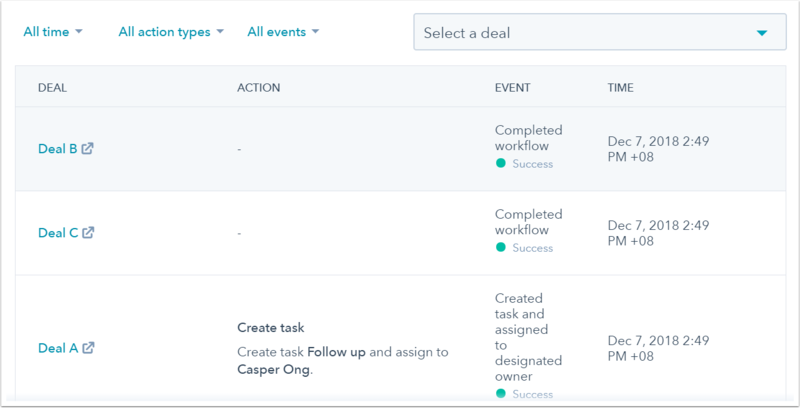 After creating your contact-based, company-based, deal-based, ticket-based, or quote-based workflows and turning them on, you can view your workflow history to see events that have occurred in the workflow, or identify the events that occurred for a specific object enrolled in the workflow. Click the name of a workflow. [Object]: the name of the object that links to its record. Action: the action that led to the event (company-based, deal-based, ticket-based, and quote-based workflows only). Event: what occurred to the object. Time: the timestamp of the event. All time: click this dropdown menu to select a different time period. All action types: click this dropdown menu to filter by action (company-based, deal-based, ticket-based, and quote-based workflows only). All events: click this dropdown menu to filter by Successful actions or Alerts and errors. This can be helpful in identifying workflow issues, such as an email failing to send to a contact in the workflow. In the upper right, use the search bar to search for a specific object. If the object is currently enrolled or has ever been enrolled in the workflow, you can view all workflow events that occurred to the object.